You may come across the name of Mu Cang Chai here and there. Know what? As a rural district of Yen Bai Province, Mu Cang Chai is settled in the northeastern area of Viet Nam. Just follow the National Road 32 from Ha Noi, you reach the beautiful site after 290km driving. The highlights of this destination are predominantly in its terraced rice fields in Che Cu Nha, La Pan Tan, and De Zu Phinh villages. The breathtaking fields have been attracted numerous national and foreign tourists coming for a Vietnam Photography Tour and get immersed in the heavenly natural beauty. When Is The Best Time For Photo Tours In Mu Cang Chai? The awesome photos of the colorful terraced rice field in Mu Cang Chai can be created in the three most imposing times. They are at the start of the crop, in the middle of the crop with the evergreen scenes, and around the harvest with the amazing golden picture. Mu Cang Chai has only one crop per year (from June to October). 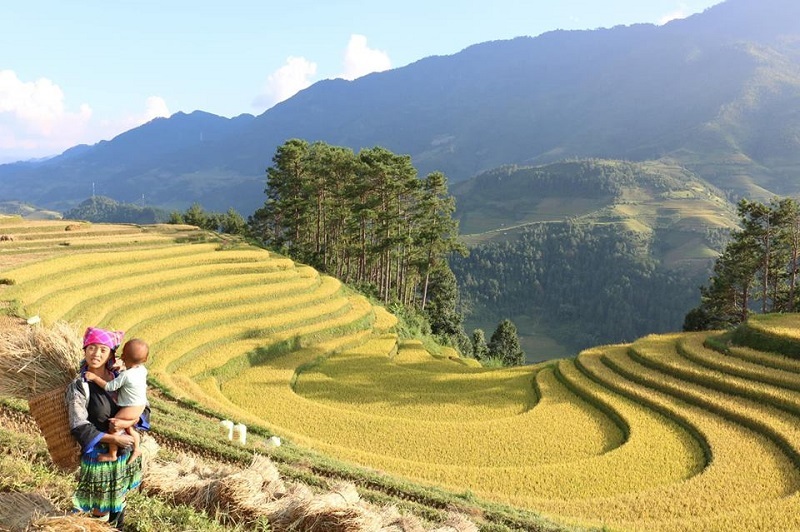 In June, the North of Viet Nam welcomes the first summer when the hill-tribe people in Mu Cang Chai Destination begin preparing for a new crop of rice. The water supplement from the top terrace of the field to the field in Mu Cang Chai is necessary. This time witnesses the formation of the “falling water season” when the water is running from the top to the bottom of the field. The best photos are also made to record the moments that the locals work on the field in groups with the beautiful hill-tribe clothing, water buffalo, rice field, etc. The amazing pictures can be drawn out exceptionally. From June to the middle of September, the whole giant terraced rice field in Mu Cang Chai is dominated by the exquisite and harmonious carpet of rice. In the hot summer sun, the green field helps you cool down. Know that there are not many local activities in the field to photograph in this season! Anyhow, the absolute greenness here surely feasts your eyes. From late September to early October, Mu Cang Chai welcomes guests to photograph the waves of the terraced rice fields that now turn brilliant yellow. They are shining in the fullest charm. The scenes now are full of the Hmong ethnic minority farmers who wear the traditional attire to harvest the ripe rice grains and shoulder bags. The images of mountains, hills, and bridges make up the imposing photos. During the harvest season, the tourists can eagerly see the ethnic-minority mothers who employ cloth as a cradle to take their infants on the back while harvesting. 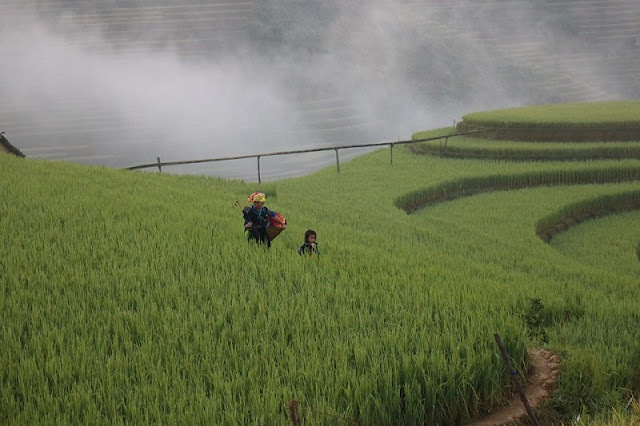 At the same time, the kids run here and there in the terraced rice fields. They are chatting and giggling with joy. The ambiance in the rice harvest season is highly distinguished. The green and yellow fields are eye-catching enough to produce the most impressive photos ever. Trust us! Mu Cang Chai Terraced Rice Field is more beautiful than any other site such as Hoang Su Phi, a mountainous region in Ha Giang. The terraced rice fields naturally rise and fall around the hillsides, mountainsides, streams, and rivers. It creates the gigantic yellow staircases for everybody to step from earth to heaven. In a word, the green and yellow terraced fields are now the symbols of the mountainous region. 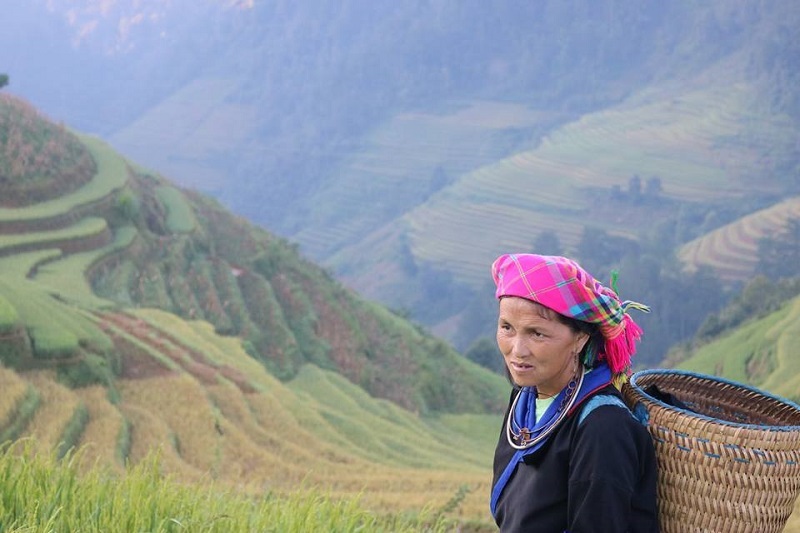 Mu Cang Chai is among the top destinations for any nature lover who likes photographing the natural essentials and the life of the ethnic minority groups. Fallen in love with Mu Cang Chai? Then, what are you waiting for? 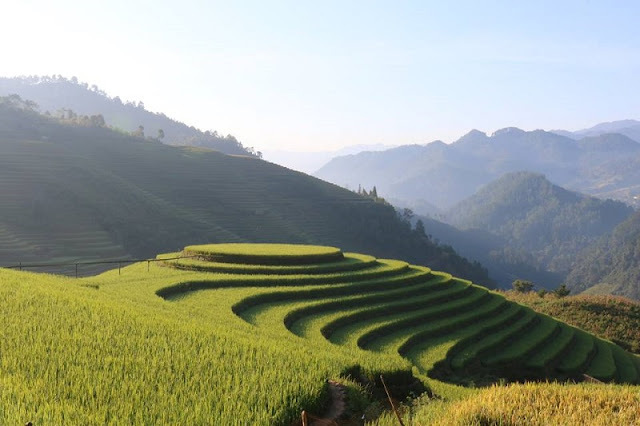 Book your Adventure vacation now with attractive Mu Cang Chai tour!